A big part of fitness and health is exercise. Sadly not all exercise is created equal. Just as not all diets work for all people, the same is true for exercise. What is true about both diet at exercise is that your individual starting point must be taken into consideration. For example, in nutrition cutting back in portions or exchanging sodas for water is a great weight loss win. For others who don’t drink soda nor overeat, that strategy is not the answer. Find the right starting point for your exercise program or the next step in your fitness level is challenging, but the surprising challenge is that you may need to find the correct exercise for your current size, age, and physical ability. Similarly to make exercise effective for you, where you start will make a big difference. Doing some small activity consistently, more than you are currently doing, or something that challenges you differently than what you have always done in the past will be key. If you have been completely sedentary and are obese walking may be revolutionary. Increase your activity level. Begin with walking one block every day and progress to one mile every day, and so on. If you are active and mobility is not an issue, then walking may not be enough. I like to walk and despise running. I recall a time during my struggles to maintain my weight when I jogged because I knew walking was not enough. Although I hate jogging, I knew that walking was too easy and in order to walk far enough or long enough to tire and feel it, that would take a lot more time that I had. Aerobics is the activity that I went to and kept me where I could manage my weight for many years. Taking group classes that elevated my heart rate like kickboxing, zumba, dance etc. Those activities got my heart rate up, burned calories, were done in an hour and helped a great deal for many years. Even at times up to four days a week at different gym locations. I credit this and my previously uneducated attempts to eat healthy for my only being 30 lbs overweight and not much more. Runners may fall into this category as well as many other physical activities including biking, swimming, and even rowing. Yeah. It worked for a while. But now? If you are doing a lot of cardio, packing on more hours of cardio is not the answer. Aerobics for me began to not have the desired results. I was heavier than ever. Conversely, others have hit the treadmill, pavement or other hamster wheel enough to not be overweight, but still not have their desired results. Cardio stresses the body differently than resistance training. Not to mention as we age, joint issues of higher impact activities can be problematic. To add insult, once your body is conditioned to specific levels of cardiovascular effort it gets easier and your benefits diminish. People get stuck at a plateau that seems unbreakable. At near 50 years old, and truly a concern for everyone over 35, the body may not replenish muscle loss as quickly. That is my theory. It is a fact that people over 35, without intervention, lose a percentage of their muscle tone and muscle strength each year. It is also true that cardio activity will burn muscle protein as quick as fat once the ready energy from food broken down in your bloodstream is used up. Combine those two facts and without great nutrition and resistance training you could be in a bad place with your health. Additionally let’s throw in metabolism. Besides not having a toned look and sag or bag in new places, this age related loss of muscle causes a reduction in metabolism. Meaning that the less muscle we have, the less food required to fuel our bodies, and therefore, we can no longer eat like we used to when we were younger. If we do, it will turn into fat. We end up weak and fat. If we watch our calories and get cardio, we could be slim and still weak. To find the right starting point for your exercise program or the next step in your fitness level is without a doubt a daunting task. Without the aid of an expert endurance trainer or specific knowledge of endurance nutrition most cardio programs will typically not tone your muscles or restore your waning metabolism. In an earlier post, I talked about balanced nutrition. There is also a great benefit to balanced exercise. With resistance training using bands, weights, and machines in enough volume and time put into the effort to make a difference you can reverse the effect of muscle loss. A structured we ight lifting plan, with enough resistance, focus, consistency, and time under tension is a big piece of the puzzle that that changed my life. Does this mean that you need to give up the activity that has always worked for you? Maybe not. A cardiovascular training program, especially for endurance sports or other goals can be part of your program, but adding balanced nutrition and some strength to your frame will be a benefit for decades to come! When I work with clients, I take their current nutrition and ability into consideration. Form, control, and amount of resistance are key elements to allow anyone to strength train. When you enter a physical therapy program to recover from injury the exercises are specific strength building exercises for that body part. If you have functional limitations to exercise, seek out a physical therapy program, do it without fail, slowly increase strength and then continue to work to build added strength until function and full mobility are restored to new levels and beyond. Bodybuilding and weightlifting are not about how much weight you can lift. That sport is called powerlifting or maybe crossfit, or another hybrid program. At its core, bodybuilding is improving strength and building muscle regardless of your starting point. Add a balanced exercise plan. Workout smarter. Not necessarily longer. Marry that with a balanced, lean, and healthy nutrition plan and there is no stopping you. It was said you are what you eat. More than that, if you fuel and exercise like an athlete each day, soon you will start to look like one! I did. My favorite website has some amazing tips provided in two different articles regarding strategies for keeping your figure, or improving it, through the holidays without food and fun deprivation. If you have ever googled a fitness related question and did not get a hit from a page at Bodybuilding.com I would be shocked. That is my favorite website and gave me tools and motivation to change my life. There are good people there who want you to succeed. Before I began a post about fit life and Thanksgiving, I wanted to find some great other sources. They had several great articles to share. Womens Right to Choose Muscle! Athletes in women’s bodybuilding now have choices. From bikini model to serious muscle with an array of organizations or federations to choose from based on the athlete’s preference and goals. It took a long time to get here. Image 1 – Suffragettes demanding rights for women. It was not long ago that women had very few choices. Gender equality has come a long way since the start of the last century. Congress passed the amendment to guarantee women the right to vote in the year my grandmother was born. This year, 2015 was the 95th anniversary of the ratification. I believe that people should be given rights and equal opportunities based on capability and not gender, or heaven forbid color or race. Men are, on average, naturally bigger and stronger. Men can, on average, lift heavier weight. If a man and a woman train the same length of time and lift the same weight, the woman will not ever develop muscles as big as the man. This is ALL due to the fact that men have naturally ten times the level of testosterone than women. Transform your body? How to transform your food! Image (1) old jeans on new body! 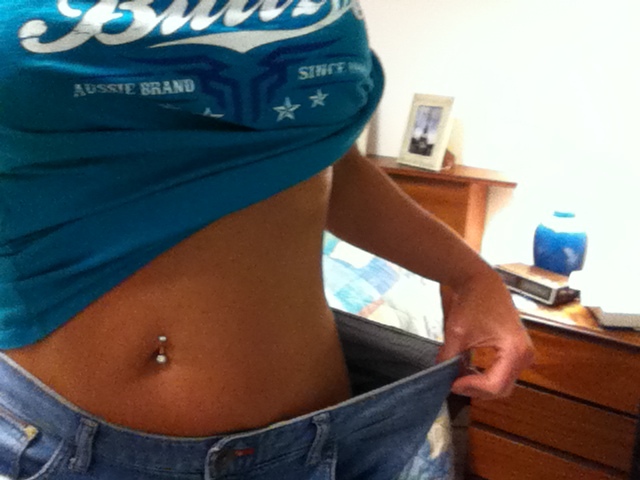 This is my awesome ‘old jeans on new body’ (image 1) with my size 12 to the size 4. If you have read my previous posts, you know that I got into bodybuilding competition as a result of lifting weights to lose weight. That was what happened. I lifted weights, did interval cardio, and lost weight. Before you could even see much muscle definition, I lost almost 30 lbs. of weight that had been accumulating for a while. However, what I am about to share is the actually bigger piece to fat loss than even how to lift weights. It is how to eat!